Arosa is a classical high-altitude resort, it is famous for its spectacular views over the peaks as it sits at the end of Schanfigg Valley around 1800m above sea level - it is the perfect break from everyday routine! The resort is a traffic-free, sun-washed, snow-reliable paradise for winter sports enthusiasts that hosts winter sports events all season long. Families are always welcome at Arosa offering wide-range of activities for every age and skill level. If you have chosen Arosa resort as the destination of your ski holidays for the whole family we at Alps2Alps will be delighted to over you great transfer service. Arosa ski club was founded already in 1903 and the local ski school in 1933, therefore it has a long history as winter sports center. The resort is neatly formed in the Graubünden mountains well above the treeline and surrounded by a spectacular series of high ridges. The slopes are wide and made for every skill level. Freeriders can expect to find deep snow areas for their pleasure. The resort is not overcrowded or overpriced, therefore you can count on comfortable, affordable world-class skiing for the whole family. Arosa can be easily reached by train from all the biggest Swiss cities. The Arosa train station offers a direct connection to the Weisshorn lift. All of the above will only result in our base-rate for ski transfers only going down. We have substantial discounts for midweek (Monday-Friday) transfers to Arosa (prices will be up to 60% lower than weekend prices) and you can save even more if travelling during the off-peak and off-season. When calculating the final price for your transfer to Arosa the vehicle utilization and availability, schedule of transfers and other costs like road tolls and parking fees are all taken into account. To discuss any specific requirements or plans to travel as part of a larger group to Arosa ski resort, get in touch with us directly. Arosa ski resort is a part of Arosa Lenzerheide ski area giving you the access to 113 pistes, of a total of 225km downhill with 56 ski lifts. One of Europe’s most impressive halfpipes is also located in Arosa as well as a huge fun park, making it a dream destination for snowboarders too. Arosa ski resort is made with families in mind offering not only great discounts, but also childcare services, world-class ski school, playgrounds, children courses, famous Squirrel trail and plenty of other activities even including ‘’Hirschi’s ski challenge’’ where you can download an app with an adventure game, explore Arosa and earn great prizes. There are two dozens of restaurants and bars in the resort, the nightlife is quite active. For the romantics, it is suggested to take the early morning cable car ascent of the Weisshorn to catch the breathtaking and spectacular sunrise. 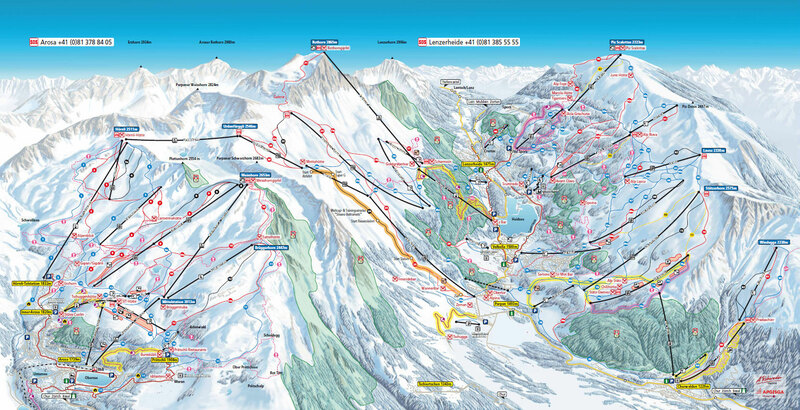 When you book your ski transfer do it as soon as possible to get the best possible price to Arosa ski resort. Be sure that we at Alps2Alps will do everything to help to make your transfer smooth and fast as possible. Wherever you choose to go, Alps2Alps will be ready to help with a first-class service!